This is the fourteenth blog in our election integrity series. The main reason candidates have to raise so much money to get elected is the enormous cost of campaign advertising. U.S representatives have a re-election campaign every two years, U.S. senators every six years, and the president hopes for two four-year terms. Terms for state and local offices vary, but candidates for elected positions, even for judgeships, have to campaign. Campaign finance watchdog Open Secrets put the final price for political advertising in the 2016 election at $6.5 billion, including both presidential ($2.4 billion) and congressional ($4 billion) elections. Democrats and Republicans spent approximately equal amounts, although in the presidential race Donald Trump spent considerably less than Hillary Clinton because Trump received free media worth more than $5.9 billion from July 2015 through October 2016, while Clinton received less than half that figure, a little under $2.8 billion. Trump’s campaign proved, for the first time, that a candidate doesn’t have to match or outspend an opponent to win an election, but it’s not likely that future candidates will be able to replicate Trump’s media success. With $6.5 billion, you could accomplish a lot of good. For example, you could fix the Flint, Mich., lead pipe problem 30 times over. Instead, the U.S. has chosen to fund a very long political contest (597 days by some measures) that is far from inspiring. And while those who donated to Trump during the campaign may be happy with the return on their investment, those who donated to Clinton, or to any other losing candidate, essentially wasted their money. 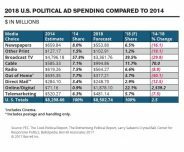 Spending on political ads for the 2018 midterms is expected to increase 2.5% to $8.5 billion. The following chart shows the amount for each medium. As you can see on the chart, although broadcast TV retained its position as the dominant form of advertising, it is expected to decline by 29.9% from 2014. By contrast, cable TV ads show an expected increase of 70%, and online/digital media are expected to increase by an astonishing 2,539.2%. All other media, including newspapers and other print media; radio; out of home media (billboards and other public displays); direct mail; and telemarketing are expected to decline. Different media have different advantages and disadvantages. Television is considered the dominant “mass medium” because it offers the greatest potential to reach the largest number of prospective voters. National broadcasters FOX, CBS, ABC, and NBC reach over 120 million viewing households and almost 300 million individual viewers, including 87% of viewers over 18. No other medium comes close. For lesser-known candidates who need to boost their name recognition, these ads are very valuable and likely worth the money. For example, challengers for seats in the House of Representatives benefit from these ads more than incumbents, who are generally better known. The evidence of the effectiveness of TV ads for candidates who are already known is sketchier. In a very competitive race between well-known candidates, ads are likely to make a difference of only 2-3 percentage points. However, some races are decided by margins this thin, so candidates feel compelled to buy the ads. Of course, not all candidates want to reach every man, woman, and child in America. By segmenting potential viewers by location as well as age, race, and gender groups, they can select specific programs, channels, and networks for the best potential results. U.S.Senate and House races, as well as local elections, usually give a boost to local TV in select markets. It’s likely that TV ads are becoming less effective than they once were. One reason is that the number of undecided voters is steadily declining as the nation becomes more polarized, so the same ad dollars are chasing fewer voters. Another reason is that the size of the television audience is eroding due to the increased use of alternative screens to view video content, including personal computers and smartphones, plus subscription video-on-demand (SVOD) services such as Netflix, which may not show ads. Also, with the growth of remote controls and mute buttons, as well as DVR and on-demand services that enable viewers to fast-forward past ads, fewer viewers may be watching the ads. Probably the main disadvantage of TV advertising is cost. According to the American Association of Advertising Agencies, national 30-second commercials created by an ad firm cost upwards of $342,000 in 2008 and more than $354,000 in 2011. I was not able to find more recent prices, but we can assume they have increased. However, the rate of increase is slowing as TV audiences grow smaller. Instead of putting most of their budget into TV, politicians may be able to get more bang for their bucks by spreading their budget across different platforms. The primary networks include ABC, NBC, CBS, and FOX. Cable TV includes all the other channels. The main advantage of the primary networks is that they will usually reach more viewers. Everyone with a TV can get these channels for free, and they will also command more attention on other platforms such as social media. The disadvantage is that ads on the primary channels will usually cost more than on cable. The benefits of cable TV are that the cost is usually much less per spot, although it reaches fewer viewers, and that cable TV has the ability to target user interests better, due to the number of niche channels. These benefits likely account for much of the 70% projected rise in spending for political ads on cable TV in 2018. While cable TV offers some ability to target specific voters, online and digital media can be even more specific. For example, Facebook’s advertising platform has incredible targeting capabilities. You can choose who will see your ads, using factors like demographics, location, and interests. Facebook calls this feature Audience Insights, and it’s one of the most powerful tools in digital advertising today. In the preparation for the 2020 presidential campaign, a study found that Trump is the biggest spender on political ads on Facebook. Trump and his “Make America Great Again” PAC spent an estimated $274,000 on Facebook ads between May and July 2018, and the ads have reached 37 million Facebook users. Facebook did not launch its archive of political ads until May, in an effort to be more transparent after accusations that it was used by alleged Russian trolls. The Facebook study did not have a tally of Republican vs. Democratic ads, although they plan to collect that data in the future. Another report claimed that in the 2016 campaign, Facebook charged Hillary Clinton more than 100 times as much for ads as it charged Trump, although that number was disputed by Facebook. Apparently, Facebook has complicated algorithms for ad prices based on, among other things, how much Facebook thinks the ad will boost traffic. Still, it seems that pricing differences should be made public and subject to the same regulations as other political ads. Video: You can expect to shoot, produce, and edit between two and-five videos, and you can use each video across all advertising platforms and share and reshare. Instagram: Assuming a CPM of $7-$9, $25,000 will buy between 2.7 and 3.5 million impressions. Snapchat: At an average CPM of between $8 and $12, $25,000 would buy between 2 and 3.1 million impressions. Snapchat also has a Geofilter than can cover your district at about $5 per 20,000 square feet. Display ads: The average CPM for display ads is $2.80, so $25,000 would buy about 8.9 million impressions. It’s possible to get these ads on a huge number of websites. They can be spread out or crammed into the weeks preceding the election. Experts estimate that people now need to see your digital content 15-20 times before you’re lodged in their brains. For your $25,000, you can make sure 600,000 people see your ad 15 times. Video ads: Running video ads costs more than running display ads, but with $25,000 you can deliver a video ad about 8.3 million times. Digital radio ads: You can run ads on Spotify or Pandora that combine a 30-second audio spot with a banner ad and get more than 500,000 impressions. A banner ad without the audio has a lower CPM, so you could buy more than a million impressions. Depending on the size of your district, you can run radio ads constantly for 3 months leading up to Election Day. Pokemon: You can turn your campaign office into a Pokemon GO gym or PokeStop and, at an average cost of $.50 per visitor, you can get 50,000 people in to battle other players or collect eggs and PokeBalls as they learn more about your campaign. Ask them to sign up for a volunteer shift before they play and you’ve killed two birds with one app. Another very potent factor that costs almost nothing is Internet memes: simple little images or ideas that spread “virally” from one person to another via the Internet. An Internet meme from the 2016 election is Donald Trump’s campaign slogan: Make America Great Again (MAGA). According to a study conducted by Forbes, political memes containing the word “MAGA” went from being mentioned once in January 2016, to 12,294 times in January 2017 with a 1,224,800% increase. In the same study, it was found that as the 2016 election date neared, there were more Internet political memes featuring presidential candidate Donald Trump than candidate Hillary Clinton, which boosted the attention to Trump. These new kinds of digital media can spread virally to a huge audience with minimal use of campaign funds. The downside is that the candidates may also have little control over how they are used. This is just a sampling of digital media. The important thing is for candidates to have a strategy that combines different platforms to target specific audiences. This can usually be done for less than the cost of a single TV ad. In addition to good targeting and low prices, digital ads have another big advantage that can help explain its astounding 2,539.2% increase in just four years. That advantage is low transparency and low regulation. In 2002, before the Internet was politically important, a law was passed requiring political ads to include disclaimers revealing who paid for the message. There were exemptions for forms of advertising in which disclaimers would be impractical, such as campaign buttons and skywriting. In 2011, after the Internet became more prominent, Facebook asked the Federal Election Commission (FEC) for an exemption. The FEC commissioners deadlocked on the decision, so no clear guidelines were established. Since that time, digital platforms have used the exemptions to avoid revealing buyers of political ads. This makes it harder to track spending on digital ads, the content of the ads, their targeted demographics, and their buyers. The FEC tracks general information on how much campaigns, political action committees (PACs) and outside spenders spend on advertising through TV, radio and print. More detailed information can be gotten from broadcast, cable and radio because stations are also regulated by the Federal Communications Commission (FCC). Stations are required to disclose more details, such as the ad buyer and what times the ads ran. Those details allow researchers to pull out trends and determine things that might otherwise be hidden, such as the messaging and the targets of the ads. But for digital, there is no regulating body like the FCC. So often, the only people who can see the actual contents of ads are the targets and the political group behind the screen. To track digital spending, researchers have to be creative. In its study, Borrell Associates resorted to subtracting money spent on ads in every other medium from the total money spent on ads to come up with the projected amount spent on digital media. The tech companies, under pressure because of alleged Russian meddling in the 2016 election, have begun moving toward increased disclosure. Mark Zuckerberg and other Facebook executives said the platform was taking steps to increase transparency and disclosure of political ads on Facebook. Days before that, Twitter announced a similar policy. Facebook said that enforcement of its new Political Ads policy would begin in May, 2018. All election-related and issue ads on Facebook and Instagram in the US will be clearly labeled – including a “Paid for by” disclosure from the advertiser at the top of the ad. When users click on the label, they will be taken to an archive with more information, such as the campaign budget associated with an individual ad and how many people saw it, including their age, location and gender. The archive can be reached by anyone in the world at facebook.com/politicalcontentads. People visiting the archive can see and search ads with political or issue content that an advertiser has run in the US for up to seven years. Advertisers wanting to run ads with political content in the US will need to verify their identity and location. Facebook requests that users report any ads that they believe have political content and aren’t labeled. Users can tap the three dots at the top right-hand corner of each ad, select “report,” and then “it refers to a political candidate or issue.” Facebook will review the ad, and if it falls under their Political Advertising policy, they will take it down and add it to the archive. The advertiser will then be banned from running ads with political content until they complete Facebook’s authorization process. Facebook will also follow up to let the users know what happened to the ads they reported. Facebook also launched a new initiative to help provide independent, credible research about the role of social media in elections as well as democracy more generally. It will be funded by the Laura and John Arnold Foundation, Democracy Fund, the William and Flora Hewlett Foundation, the John S. and James L. Knight Foundation, the Charles Koch Foundation, the Omidyar Network, and the Alfred P. Sloan Foundation. In consultation with the funders, Facebook will invite respected academic experts to form a commission which will then develop a research agenda about the impact of social media on society, starting with elections. Goals are to understand Facebook’s impact on upcoming elections, such as in Brazil, India, Mexico and the US midterms, and to inform future product and policy decisions. One particularly controversial practice by Facebook is fighting “fake news” by using third-party fact-checkers. If the fact-checkers rate a story as “false,” then Facebook reduces its distribution. The reason this practice is controversial is because the third-party fact checkers are often biased. For example, when Facebook selected the right-wing magazine The Weekly Standard as an official fact-checking partner, progressives warned that the conservative publication would use its power to suppress accurate articles published by center-left and left-wing outlets. And apparently this is exactly what happened. Several popular left-leaning and progressive content creators on Facebook have either been booted from the site with no clear explanation as to why, or they have seen their traffic take a nose dive after being erroneously flagged as fake news. While it’s true that right-wing extremist Alex Jones of Infowars was also booted off, progressives believe that booting anybody is a mistake, since censoring free speech is always anti-democratic. And of course, Alex Jones’ hate speech is not the equivalent of accurate reporting by left-leaning journalists. Gomes did not specify just what “adjusting signals” meant in regard to political content, nor did he define authoritative vs. low-quality. Google and its employees have historically refused to release details about how results are filtered and prioritized, citing competitive concerns and also worries that providing too much information would allow website producers and publishers to game its algorithms. A number of left-liberal and socialist websites appear to have been impacted negatively by Google’s adjustments. Andre Damon, who has written a number of articles on the subject for the World Socialist Website, accuses the search giant of intentionally trying to silence leftist voices. Damon criticized Google for de-prioritizing the World Socialist Website on several keywords that used to bring significant traffic to the site, including searches for the term “socialist” (which suddenly became fashionable in 2016 with the popularity of Sen. Bernie Sanders). Utilizing tools from Google, a web analytics company called SEMrush, and other methods, Damon calculated that between April and September, 2017, search result traffic to the World Socialist Website has dropped 45 percent. He found similar declines at several other left-leaning sites, including AlterNet, Democracy Now!, Common Dreams, and Truthout, all of which have editors who review articles for accuracy before they are published. Search referrals have decreased so dramatically for AlterNet that the publication has had to resort to donations to keep itself in business, executive editor Don Hazen announced in a Sept. 28, 2017 article. “Fighting fake news, which Trump often uses to advance his interests and rally his supporters, is an important goal that AlterNet shares,” Hazen wrote. He continued: “But little did we know that Google had decided, perhaps with bad advice or wrong-headed thinking, that media like AlterNet—dedicated to fighting white supremacy, misogyny, racism, Donald Trump, and fake news—would be clobbered by Google in its clumsy attempt to address hate speech and fake news.” Citing statistics generated by Google’s Analytics service, Hazen wrote that AlterNet’s search traffic had decreased by 40 percent since the April announcement, a decline of more than 1 million visitors a month. According to another web tracking company called Quantcast, AlterNet’s total traffic has declined from 5.5 million unique visitors in March to 2.6 million in September. “Google’s undermining of progressive journalism means we have lost a major chunk of audience and as a result are looking at big potential losses in ad revenue,” Hazen told his readers. Writing at In These Times, journalist Julianne Tveten argued that media companies and tech firms are being tricked by a “Russia-Fearmongering-Industrial Complex” which grossly exaggerates the significance of evidence of Russia’s involvement in Trump’s victory. Mainstream media’s message remains clear: Only the corporate-sponsored center can be trusted,” she wrote. A Google representative asserted that Google continually hears complaints from both left- and right-wing organizations about its results. It’s certainly true that the far right has complained about Google. Most recently, the Daily Stormer, a neo-Nazi website, has called for the nationalization of Google. Google seized the Daily Stormer‘s domain after the rally in Charlottesville, Virginia that led to the death of a leftist counter-protester. Other far-right web broadcasters have criticized Google’s YouTube service for blocking them from making money on their videos. During the time he was a presidential adviser, Steve Bannon apparently promoted the idea within the White House of regulating Facebook and Google like public utilities. But the tech giants’ attempts to self-regulate haven’t stopped federal, state and local governments from proposing their own regulatory measures ahead of the 2018 midterms. On March 26, 2018, the FEC published a Notice of Proposed Rulemaking (NPRM) seeking comment on proposed revisions to the disclaimer regulations as applied to public communications over the internet. On June 27-28, 2018, the FEC held a public hearing on its NPRM on internet communication disclaimers and the definition of “public communication.” The Commission received over 165,800 written comments on the NPRM, and 18 witnesses testified at the hearing. The 18 witnesses who testified at the public hearing represented a range of interests including political party committees, advertising vendors, academic researchers, industry associations, consumer groups, and other charitable and social welfare organizations. Although some witnesses testified against additional regulations on free speech grounds, most witnesses supported the Commission’s adoption of revised rules to address disclaimers on internet ads. As of this writing, no further action has been taken. The move follows similar legislative attempts by Senators Amy Klobuchar (D-Minn.), Mark Warner (D-Va.) and John McCain (R-Ariz.), who introduced the Honest Ads Act in October 2017. The bill, which also had a companion in the House, would require digital platforms like Google, Facebook and Twitter to release information about the purchasers and targets of online political ads, and require those ads to be made publicly available. The idea has also gained traction in state legislatures. The Vermont State House advanced a bill that would require state and local buyers using Facebook and Twitter to identify who they are and who they’re supporting in their ads. While there are rules regarding rates paid for political advertising on traditional media, the rules don’t apply to digital media. For example, the possibility that Facebook could have charged Clinton more than Trump for political ads could not have happened with traditional media. The FCC’s rules for radio and TV ads require that all candidates for political office receive equal time, cost, and treatment as their opponents and also equal to other businesses buying ad time. In addition, the ads must make it clear to the viewers who purchased the ad and whether or not the ad is part of the candidate’s campaign effort. Stations are required to accept ads from candidates for federal offices, but they do not have to accept ads from state or local candidates. However, if the station does accept a political ad, they should be ready to also accept one from the candidate’s opponent. Usually, they accept ads from state and local candidates because of the revenue. The large media companies that own most local television stations and the Wall Street investors who hold their stock have come to rely on the bi-annual infusion of political cash that floods stations fortunate enough to be in the “right” markets. It has been suggested that one way to solve the campaign finance problem is to require radio and TV stations as well as digital media to provide free air time for political ads the way they do in some other countries. After all, don’t the taxpayers own the “public” airwaves and the Internet? By law they do, but you would never know it. The U.S, could have created something like the British Broadcasting Company (BBC), which is required to be free from both political and commercial influence and to answer only to its listeners. The BBC may not show commercial ads on TV, radio, or on the Internet in the UK. It receives its funding from a license fee paid by buyers of radio and TV sets, and it is expected to produce programs that commercial broadcasters normally would not. The U.S. rejected the BBC model and opted instead for commercial broadcasting on privately owned stations. But the frequencies were public, as specified in the Radio Act of 1927. Broadcasters did not pay for their station licenses and they received no property rights to the frequencies. The renewal of their licenses was supposed to depend on how well the station served the public interest. As the (FRC) explained, “the station must be operated as if owned by the public…It is as if people of a community should own a station and turn it over to the best man in sight with this injunction: ‘Manage this station in our interest…’” The Commission made clear there was no room for “propaganda stations” as opposed to “general public-service stations”. In 1930 the FRC denied a license to a Los Angeles station used mainly to attack Jews, Catholics, and law enforcement because the station was not operating in the public interest. In 1949, the FCC introduced the Fairness Doctrine: Broadcasters had to devote “a reasonable percentage of time to coverage of public issues; and [the] coverage of these issues must be fair in the sense that it provides an opportunity for the presentation of contrasting points of view”. When Ronald Reagan became president in 1980, the rules for broadcast licenses changed. The FCC eliminated the requirement that licensees provide detailed program information as the basis for license renewal. In 1984, the FCC eliminated programming guidelines that set minimums for news and public affairs programming, and stopped enforcing the Fairness Doctrine. When citizens groups sued to reinstate the doctrine, Appeals Court Judges Robert Bork and Antonin Scalia, two Reagan appointees, concluded that the Fairness Doctrine itself was not a law but a guideline. In August 1987, the FCC unanimously decided that the Fairness Doctrine was contrary to the public interest. Congress then stepped in. The House voted by an overwheming 3-1 margin and the Senate by a margin of almost 2-1 to pass a bill that clarified that the Fairness Doctrine was indeed the law. However, Ronald Reagan vetoed the bill and there were not enough votes in the Senate to override the veto. The new conservative majority led to waves of giveaways to powerful media corporations, the outright sale of frequencies, and the reversal of the foundational rules of the airwaves, nearly wiping out any acknowledgment that the airwaves belong to the people and should be managed as a public trust. Talk radio has changed the nature of political discourse, and some say it has changed our very culture. Media scholar Henry Giroux describes a “culture of cruelty” increasingly marked by racism, hostility and disdain for others coupled with a simmering threat toward any political figure who comes into the crosshairs of what many now call hate radio. Seventy five years after the Federal Radio Commission declared no room on the public airwaves for “propaganda stations” and denied a license renewal to a station that attacked Jews and law enforcement agencies, the air waves are filled with both propaganda and venom. Today the airwaves, stripped of commons rules, feed hatred. Since election laws are affected by who is in power and the judges they appoint as well as who owns the airwaves and other historical issues, American political campaigns are quite different from campaigns in other democracies. As we have seen, the United States does not provide free air time to candidates. The UK, France, and Germany, by contrast, ban paid political advertising and instead offer a certain amount of free broadcasting time during election periods. Allocation, length and frequency of political advertisements are decided and enforced by independent or state regulators. Provision of free air time to parties and candidates relative to their electoral influence gives media access to smaller players, creating a more level playing field. This type of regulation is considered necessary to control the corrupting influence of big money on politics. Overseas election campaigns also tend to be much shorter than ours. The UK’s 2015 election lasted 139 days, and Canada’s longest election lasted just 78. In Japan, campaigns are limited to 12 days by law. But here in the United States, the Supreme Court has struck down most limits. Their decisions were usually along party lines, suggesting that we would have quite different election laws if we had a different court.